To survive in the competitive business world today, a machining center must be able to operate at top capacity without any wasted time or labor. 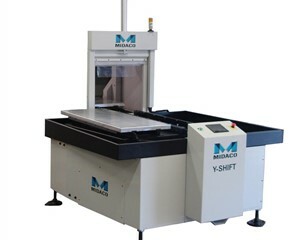 At MIDACO, we’ve specialized in productivity-maximizing manufacturing solutions since 1969—and our y-axis shift automatic pallet changers are just one of the latest innovations designed to boost your company’s bottom line and contribute to sustainable profit and growth. 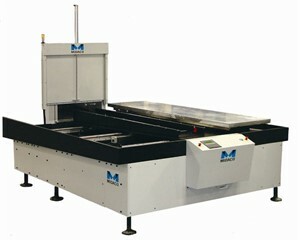 Ideal for configurations that require only Y-axis milling, MIDACO’s y-axis shift automatic pallet changers are mounted on one side of your Vertical Machining Center (VMC) and include the following components: a pneumatic machine receiver with air blast, two heavy-duty pallets, and an end load shuttle unit with automatic door system and indicator lamp. While one of the two pallets are being milled inside the VMC, the other can be prepared by the machine operator—reducing idle time and maximizing productivity. Once the machining is finished, the aluminum pallet changer switches the pallets automatically.